My youngest piglet, Baby (appx. 4 years old), was diagnosed about 6 months ago with retinal degeneration. I noticed some time before that her iris seemed to be disintegrating, especially in her left eye. The prognosis is that it will continue to get worse (it has, picking up speed in the last few months), and that her retina might 'detach', which would be extremely painful and necessitate removal of the eye. She is an inbred pig (uncle and dad were the same pig, as far as I can tell), and the vet suspects that is the cause. So far it does not seem to be bothering her / causing discomfort, and I'm hoping against hope that it will continue that way. But, since the left eye seems to be degenerating so quickly, I'm not holding my breath. And, the right iris is degenerating too -- I'm guessing she'd be okay without one eye, but without either? Ugh. I haven't been able to find any information about this online, having done multiple searches in the Guinea Lynx archive and across the web, but maybe I'm just not hitting on the right search terms. So I thought I'd try to post. Has anyone experienced this before with one of their little ones? If so, what was the outcome? While it sounds terrible to think of a guinea pig with no eyes at all, I have at least one here that doesn't see much - and I know of others that are almost blind (Sparkles N Daisy's girls). While having no eyes at all would remove even light and dark shadows (that I think the blind ones I know of do see), I don't think it would be quite as bad as it sounds. I hope you can find out some more information though - it must be very worrying. I don't know why but I would have guessed retinal degeneration would just result in blindness and not the loss of an eye. That particular terminology has never been used on the board (so you would not have found anything). If you search using enucleation I think you'll find some helpful info. In humans, as far as I know, detached retina is not painful, although if not repaired it will result in blindness. Its symptoms are vision problems, not pain. Blindness is certainly unfortunate, but I've sure read about blind pigs doing just fine. Does anyone know why detached retina would be painful in pigs, and possibly require enucleation? It doesn't in humans. Are you sure this would be required? I wrote you that it reminded me of osseous something or other. I've posted about it but don't remember the name. Thanks, everyone, for your thoughts so far. My mind's a little more at ease... Although the vet who diagnosed her is by far the most cavy-savvy vet around and has done some amazing things with my little ones surgery-wise, he's also made a few comments here and there that lead me to believe he's better in the operating room than he is with some of the more general issues. I'm hopeful now that the worst that will happen is continued degeneration and maybe eventual blindness -- blindness I can handle, since they're not very well sighted anyway... The thought of her being in severe pain is much harder to take. 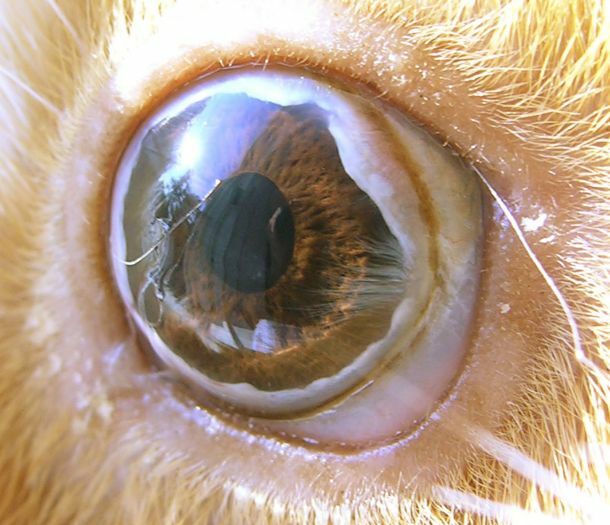 Speaking of which, the vet said that once the retina detatched, her eye would bulge and she would be in noticeable pain. I don't know why he said this or where he got the impression this might happen -- maybe he treated a pig in the past who had these same symptoms combined with glaucoma or something else (hopefully) unrelated. Thanks again, Lynx, for hosting the pictures and directing me to the past threads. Much appreciated. As you all can see from the pictures, she has pea eye and her eyes have always been crustier than most. But otherwise, she's pretty healthy (knock wood). I'm still curious to hear from anyone else who might have experience with this, but thanks again to those who've replied so far and pointed out that a detached retina may not lead to enucleation. Oh, forgot to mention that the vet did say an option might be to try and reattach the retina surgically if/when it does detach. He also said it would be in the neighborhood of $4K. Given that I would like all my critters (and me!) to have a roof over our head and food in our bellies, I think I won't be taking that road, especially given the super low success rate that he mentioned!!! There are veterinary opthamologists. They are MUCH more knowledgeable than most vets about eye problems. Swannie saw one for a problem her guinea pig had. Blind pigs can get by pretty well. I would not go for this surgery either. Those pictures are fantastic. Sorry I don't have anything consturctive to add. spyturtle, I don't want to give the impression I know anything at all about retina detachment in animals. I was only wondering why it would be painful in animals when it isn't in humans. There may actually be some reason. I think a veterinary opthalmologist would be a good idea. One of my horses had uveitus and eventually lost the sight in her eye. Her retina detached, and it kept hitting nerves in the eye and was extremely painful (you could tell by the way she'd jerk her head every few seconds). Her eye was removed. 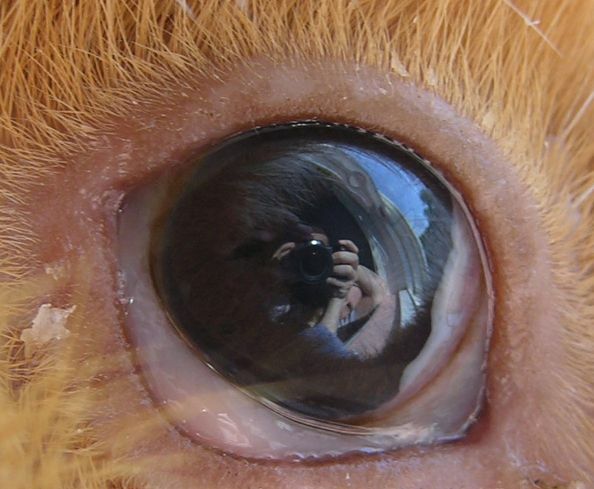 Of course a horse's eye is much bigger than a guinea pig's! I have an opthamologist for my cat; I will get an appointment for Baby as well. I realize that the scenario my vet mentioned may still be a possibility -- didn't want to give the impression that I'm not still worried, just a little more hopeful that it might not be inevitable... Thanks again everyone for your posts! Resurrecting a very old thread since I've gotten several contacts about the photos posted here recently -- thought I'd share what little more I have on the subject (what we've since learned to be osseus metaplasia). We lost Baby in December '07 to something completely unrelated, and although the degeneration continued, she never appeared to have any pain in her eyes (or sight loss, although that's difficult to ascertain with these critters, of course). I saw signs of o.m. in several of my other older pigs, and have learned not to worry -- I've never had this lead to other problems / pain. The questions I've received re: this thread have been about the photos, so I'd just like to say that anyone is welcome to repost or use them in any way that might be helpful to other pig-slaves. Thanks so much for providing an update. I am so sorry you lost Baby. Unusual that Spud has the same condition. I do get occasional requests about pics and always direct inquiries to the photographer. I should start a collection of permissions from photographers concerning reuse. Thank you, Lynx, for providing such a great forum. It's been a great source of information throughout the years. I'm wondering how unusual o.m. is, since I've seen so much of it -- at least some signs of it in something like half the pigs I've taken in in the last ten years or so (3 out of 7). Or, perhaps it's something environmental. I can't imagine what, though -- they've all lived in a well-ventilated area with Carefresh, so unless there's some kind of hidden factor here, I have no idea. Hopefully we'll know more about this someday. Sounds very very unusual to come across so many cases. I wonder what it could be. Though we've had a few other cases here, it does not seem all that prevalent. One thing you might do is contact other guinea pig owners in the area who care for their pigs pretty well (longer lives) and see if they have the same experiences.